The Environmental Protection Agency (EPA) said that cars with 3.0 litre engines from the years 2014 to 2016 were affected. However VW denies the vehicles have software designed to cheat tests. Instead the company says that cars with the 3.0 litre diesel V6 engines "had a software function which had not been adequately described in the application process". Volkswagen said it was cooperating with the EPA to "clarify the matter". "Volkswagen AG wishes to emphasize that no software has been installed in the 3-liter V6 diesel power units to alter emissions characteristics in a forbidden manner," the company said in a statement. Meanwhile, Porsche said it was "surprised" by the EPA's allegations. "Until this notice, all of our information was that the Porsche Cayenne diesel is fully compliant," it said in a statement. "VW has once again failed its obligation to comply with the law that protects clean air for all Americans," said Cynthia Giles, assistant administrator at the EPA's enforcement unit. Although the number of cars involved in the US is relatively small, the latest allegations from the EPA represent a very serious new headache for Volkswagen. Firstly, it suggests that the fitting of defeat devices was more widespread than previously thought - although VW has issued a statement contesting the EPA's verdict. If the EPA sticks to its guns, that could mean higher fines, more lawsuits - and yet more recalls over and above the millions already announced. So the multi-billion dollar bill for the scandal may get a lot bigger. And then there's a new brand involved: Porsche. 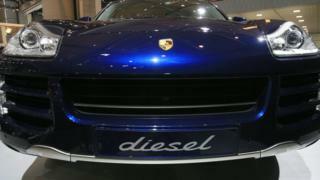 Not a manufacturer usually associated with diesel motors, but in fact they are a popular option for larger models such as the Panamera, Macan and Cayenne. This is very bad news for VW's new chief executive, Matthias Mueller. He's the man charged with clearing up the mess at the company. But since he was head of Porsche before taking on the top job, if there was wrongdoing associated with Porsche cars, it would have happened on his watch. In early September Volkswagen admitted to the EPA that cars from the model years 2009 to 2015 contained software designed to cheat emissions tests. That prompted US regulators to run further tests designed to detect such defeat devices and led to today's announcement from the EPA. "These tests have raised serious concerns about the presence of defeat devices on additional VW, Audi and Porsche vehicles. Today we are requiring VW Group to address these issues. This is a very serious public health matter," Ms Giles said. Regulators all over the world are now looking at Volkswagen's diesel cars and the company is also facing criminal investigations. The company's chief executive Martin Winterkorn resigned in late September as the scale of the scandal emerged. At the time he said he was "not aware of any wrongdoing on my part" but was acting in the interest of the company. VW said it had set aside €6.7bn ($7.4bn; £4.8bn) to cover costs related to emissions cheating, which left it with a €2.52bn pre-tax loss for the third quarter of the year. Many analysts expect that the firm will have to set aside more money to cover the recall of cars, penalties and lawsuits. Help! I'm a VW car owner, what should I do?